Fall festivals are as much a part of fall as early sunsets and crimson leaves. Across the country, we see harvest and craft festivals steeped in tradition and regional pride sprouting up this time of year. If you live in or near a region rich in agricultural abundance, chances are there’s a local fall festival celebrating the bounty just a short drive away. "Festivals provide live entertainment, music, speciality foods, kids zones, and hands-on craft projects," said Liz Rosinski of Harvest Festival Original Art and Craft Shows, the largest arts and crafts show on the West Coast that's been organizing shows for 45 years. "What's great about these events is they provide an outlet for independent artists, and it helps them get the word out about their products." In the age of Internet shopping, customers can't always get a good look at what they're buying online, Rosinksi said. Harvest festivals not only allow consumers to look at and touch objects made by local artisans, it also allows them the chance to interact with the creators. "You get unique, American-made gifts you can't get at the mall," she said. "And it's a chance to talk with the artists and learn how they make their crafts." From hot air balloon rides over the Adirondack Mountains to pumpkin villages in Dallas, and the country’s largest Oktoberfest in Cincinnati, here are a few samplings of some of the country’s most notable harvest celebrations and craft shows. Harvest festivals originated from pagans in Britian who wanted to celebrate a successful growing season. These celebrations typically happened around the autumn equinox. In fact, the first full moon around the autumn equinox is known as the Harvest Moon. In 2017, the Harvest Moon occurs Oct. 5. Early English settlers took the idea of harvest thanksgiving to North America. Thanksgiving--the most popular harvest festival in North America, began with pilgrims and indigenous people in 1621. Harvest festivals spring up in virtually every county across the United States this time of year, and for good reason. "It's a great way to spend a weekend," Rosinksi said. 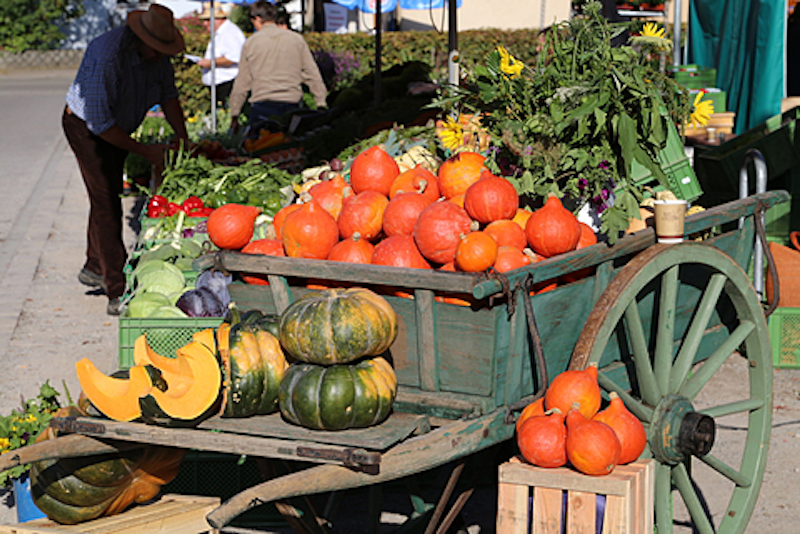 80th Annual Arroyo Grande Harvest Festival, Arroyo Grande, California, September 22-23. Festivities include a scarecrow decoration competition and parade. Acadia Night Sky Festival, Acadia National Park, Maine, September 21-24. Kayaking tours and photography classes are available at this National Park famed for its night skies. Alameda Harvest Festival, Pleasanton, California, October 27-29. This annual tradition celebrates its 23rd year. Adirondack Balloon Festival, Glens Falls, New York, September 21-24. Take a tour in a hot air balloon above the Adirondacks. Autumn at the Arboretum, Dallas, Texas, September 23-November 22. Visit the acclaimed pumpkin village at this two-month long event. Bayfront Festival Park, Duluth Minnesota, September 9. Live music, handcrafted items and more await at this 24th annual event. Hosted by the Lake Superior Chapter of the Sustainable Farming Association. Breckenridge Oktoberfest, Breckenridge, Colorado, September 8-10. This Munich-style street faire includes polka music and authentic German cuisine. Cedarburg Wine & Harvest Festival, Cedarburg, Wisconsin, September 16-17. A pumpkin weigh-off, live music, speciality food, and a grape stomp competition are among the scheduled events. Events take place throughout downtown Cedarburg. Country Living Fair, Columbus, Ohio, September 15-17. Open from 10 a.m. to 5 p.m. Events include seminars, demonstrations, and live music. Del Mar Harvest Festival, Del Mar, California. Oct. 13-15. This Friday, Saturday, Sunday event features live music all day long. Heritage Harvest Festival, Charlottesville, Virginia, September 9. Located at Thomas Jefferson’s Monticello estate, the single-day event celebrates Jefferson’s agricultural and epicurean legacy. Events include pepper and melon tastings, a seed-swap, and a workshop on African-American culinary history. Lodi Grape Festival and Harvest Fair, Lodi, California. September 14-17, 2017. Four days of wine tasting, grape murals, food and carnival fun. The musical headliners are sure to rock your world. Madison County Covered Bridge Festival, Winterset, Iowa, October 14-15. Celebrate the bridges of Madison county in America’s heartland with games and a parade. Five of these six covered bridges appear on the National Register of Historic Places. National Apple Harvest Festival, Arendtsville, Pennsylvania. October 7-8 and October 14-15. This tradition that’s more than 50 years old includes crafts, live music and apple-picking. Natural Products Harvest Festival, Baltimore Maryland, September 13. This one-day gala is part trade show, part harvest festival. It focuses on organic and natural products and serves as a showcase for new products. Oktoberfest Zinzinatti, Cincinnati, Ohio, September 15-17. This event in southwest Ohio is the largest Oktoberfest celebration in the United States. Route 91 Harvest Festival, Las Vegas, Nevada, September 29-October 1. This three-day event is sponsored by SiriusXM and includes a variety of country music acts. Sacramento Harvest Festival, Sacramento, California. November 17-19. November 17-19. Live music, crafts and seasonal treats await at this three-day celebration in Cal Expo. San Jose Harvest Festival, San Jose, California. November 24-26. This 40th annual celebration features a three-day festival with live music. Group tickets are available. San Mateo Harvest Festival, San Mateo, California, November 10-12. This Bay Area harvest festival is celebrating its 45th year of existence. Scarecrow Festival, St. Charles, Illinois, October 6-8. A petting zoo, live music and, of course, plenty of scarecrows await at this three-day celebration. Sharon Springs Harvest Festival, Sharon Springs, New York, September 9-10. The annual gathering celebrates fall’s bounty. Events include live music, arts, crafts, contests, and more. Sonoma County Harvest Fair, Sonoma, California, October 6-8. Take part in a grape stomp and cow-milking competition at this three-day celebration. Of course, the region famed for its winemaking will have wine-tastings and a competition. Ventura Harvest Festival, Ventura, Californai. October 6-8. 28th annual harvest celebration with live music. Vermont Pumpkin Chuckin’ Festival, Stowe, Vermont. October 14-15. Witness trebuchets and various devices launching pumpkins into the sky to see who can hurl them the furthest. Warrens Cranberry Festival, Warrens, Wisconsin. September 22-24. More than 100,000 people are expected to attend the world’s largest cranberry harvest celebration that includes marsh tours.